What Does The Number Eight Mean In The Bible?From series What Do The Numbers In The Bible Mean?. If the number seven represents perfection, then how can you improve beyond it? You might think that logically the numeric code of the bible would stop after perfection, but, of course, the number seven is not the last number in the code. As you have learned, the first three numbers of the numeric code are spiritual numbers, and the next three numbers in the code are physical numbers. The number seven begins a new series of three numbers that relate to different aspects of completion. The number seven addresses completion as it relates to perfection. The number eight approaches completion from a different direction. It symbolizes the evolution from imperfect worldly creations to the next level of existence - as members of the kingdom of God. Do not be thrown off by the use of the term evolution. What is meant here by evolution is not the debated theory that in some forms denies the existence of God. I could have substituted the term 'development' for evolution, but development does not connote all the dimensions contained in the term evolution. Since the expulsion from the Garden of Eden, mankind has evolved, and the number eight is used to describe his progress. 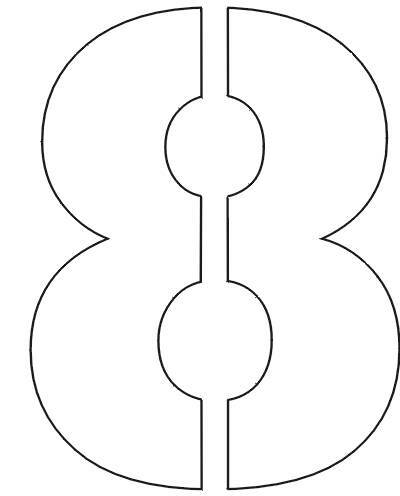 The number eight is the perfect symbol of balance or cause and effect. It is associated with having left the carnal world for the spiritual world. Since Old Testament times, the resurrection of the dead has been viewed as a step in man's evolution, so the number eight becomes the number symbolizing resurrection. It is associated with faith, as the bridge that allows the unsaved under the law to be saved through the grace of the Lord. Finally, the number eight has an association with Jesus as the ultimate man. This association is fitting since Jesus represented man as he needs to be in order to enter the Kingdom of God.